The green grass glows almost like neon as the winter gray slowly fades away. Coats go back in the closet and snow blowers are stored in the shed until next year. Spring has arrived, and so has America’s oldest and most endearing pastime, baseball. This is a game built to stand the test of time and in that way mirrors what we all hope for our marriages. 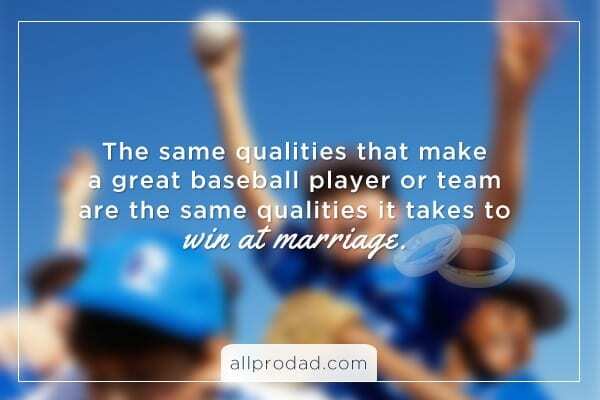 The same qualities that make a great baseball player or team are the same qualities it takes to win at marriage. In honor of both, we break down each position in baseball and explain how they can relate to our blessed unions. Take the game of baseball and apply it to your marriage. There are 7 Ways Marriage is Like Baseball. Let’s look at how each position in baseball can improve your marriage. Like the first baseman, married partners need to be sturdy and reliable. He is always consistent and the rock of the team. It’s important to be the type of man that can dig a ball out of the dirt just in the nick of time to beat the runner and get the out. Our wives depend on us in that same way. The second baseman is rarely the star that gets the glory. As with marriage, there are many different ways challenges can turn into errors. It matters that husbands are willing to do the little things even when they become mundane, because that’s what sets up the ability to win. The shortstop is quick and kind of the oddball. Marriage needs spice to keep it interesting, and shortstops do that for baseball. They usually are terrible hitters, but in the field they will astonish while making a spectacular diving stop that seemed destined for the outfield. The shortstop brings fun and excitement to the team. Third base is called the “hot corner.” Balls come off the bat screaming his way and he only has time to react. We must be prepared for these moments to react well, or we will get eaten alive. When things get overwhelming, our anger can get riled. That’s when we need to have the character of the third baseman. Adapt to the situation quickly and put out the fire. An outfielder is blessed with speed and grace. He will have to cover long distances in a hurry to make the play, and he’s often called upon for damage control. A marriage needs partners willing to go to the distance and have the skill to make the right decisions with the ball. When his marriage is in trouble, he can correctly analyze the situation and then make the right adjustments to steady the situation. He’s the person in the spotlight. The pitcher faces great scorn or gains tremendous accolades depending on the performance. The great ones never forget a mistake and always work to correct them. He’s striving for personal growth and improvement at all times. This is highly important in marriage, because as our families grow, the dynamics are constantly changing. We should be working to keep up with the evolving challenges. Every marriage needs discipline, leadership, and great communication. The catcher is a fully grown man. His experience and wisdom allow him to make solid decisions, and his endurance and character set the example for his family. Husbands need to see the big picture and communicate that effectively. In doing so, we humbly guide our marriage to the ultimate goal, which is of course, victory.